Rosenkavalier, Frau Ohne Schatten, Moses Und Aron, Haendel's Messiah -- there are so many recordings from Sir Georg Solti's extraordinary career that will remain for as long as people listen to music. Really, if you have to pick just one, you probably can't, and with good reason. 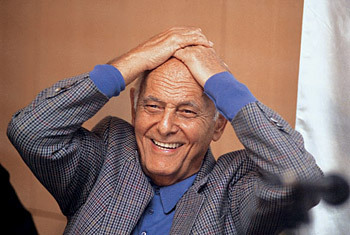 And next Wednesday, it'll be 10 years since Georg Solti's death. Chicago Tribune critic John von Rhein, who "caught virtually every program Solti conducted at Orchestra Hall from 1978 to 1997", remembers the maestro here. His statue stands in a Chicago park though not, yet, in a London square. He conducted 300 recordings, launched dozens of careers and, at the time he died, was paying for scores of kids all over the world to go to college at his expense. No homeless person was ever turned away from his Hampstead door. He never forgot his wartime poverty in Switzerland, while his family were being oppressed and massacred back home.